Mica is an advanced web application designed to create data web portals for large-scale epidemiological studies or multiple-study consortia. It provides a structured description of consortia, studies, annotated and searchable data dictionaries, and data access request management. Mica Server Java server providing web services (REST) for managing, storing, searching Mica Domain content and communicating with other servers listed below. Opal Server Java server providing web services (REST) for importing, transforming and analyzing study variables. Agate Server Java server providing web services (REST) for user management and notifications. Mica Web Application Front-end to Mica Server providing client interface to manage Mica Domain content as well as to administrate and configure access permissions and secure connections. Mica Drupal Client Extension of the Drupal Content Management System (CMS) allowing to build a web data portal with Mica’s published content. 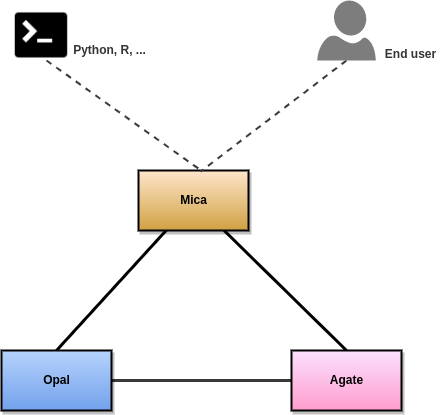 Mica Python Client Python front-end to Mica server providing services for administrative command-line and automation tasks. Mica R Client R front-end to Mica server providing services for Mica content analysis and reporting. Editors and reviewers of the Mica web portal content can access to the web interface of this server as described in the Mica Web Application User Guide. Data access request form can also be configured through this web interface. Installation and configuration guides can be found in the Opal documentation. Installation and configuration guides can be found in the Agate documentation.